Bike trail detour options in Maryland's suburbs are coming under fire by riders now that construction of the long disputed Purple Line is underway. 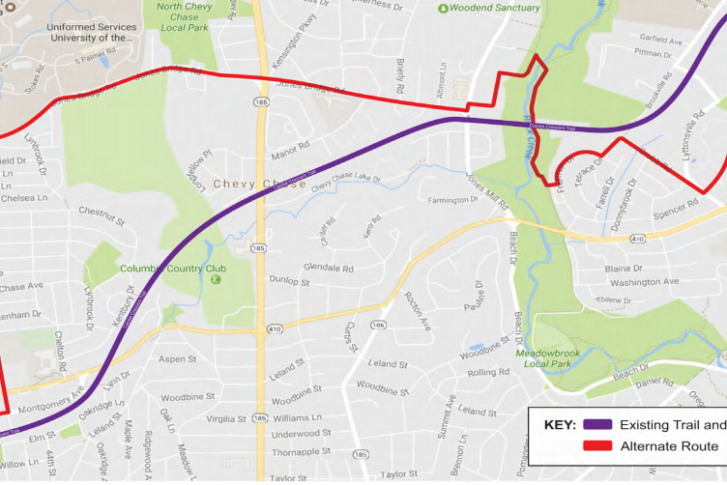 WASHINGTON — A popular bike trail that connects some Maryland suburbs to the Capital Crescent Trail will close during construction of the Purple Line and some riders aren’t happy with the suggested detour. The Georgetown Branch Trail, which links Bethesda and Silver Spring, will close on Tuesday. It could be five years before it reopens to trail users. Detour options are coming under fire by trail users now that construction of the long disputed line is underway. Avid riders will likely choose a new route through Chevy Chase, according to Colin Browne with the Washington Area Bicyclists Association. “If you know the neighborhood and know the area and are confident on a bike, you’ll be fine,” he said. But the official detour travels, in part, along Jones Bridge Road, a busy thoroughfare often clogged with cars during rush hour. Browne said the trip could be potentially unpleasant for riders. “It means that the folks who are least certain about where they are and least confident on a bike are the folks who are going to rely on the signage to say, ‘Okay I need to go this way’,” Browne said. The detour could also change during the trail’s closure.